Here in a time where the classic slot theme isn’t as prevalent as it once was, Diamond Strike have brought it back to give players a feeling of nostalgia. The standard fruit symbols have returned and mixed with new and exciting bonuses, it’s the perfect blend. Diamond Strike is a 5-reel slot and gives players the chance to activate a maximum of 15 pay lines. Whether you’re a fan of classic slot themes or not, the bonus features and diamond wilds will appeal to everyone. Deposit today at your favourite casinos and enjoy this Pragmatic Play creation, find out more! As you open the Diamond Strike slot, you’ll be greeted with the familiar sounding noises of casino slots and coins rattling in and out of the machines. These soothing tones set you up nicely for what’s undoubtedly a great gaming experience. 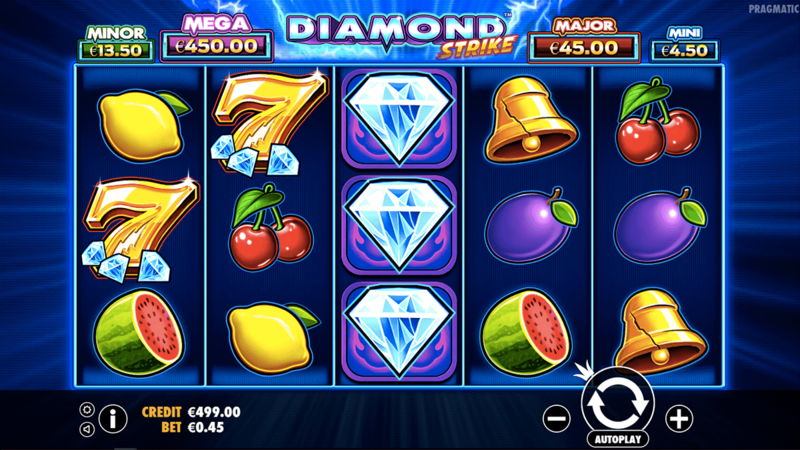 * DIAMOND WILDS – The Diamond WILDS substitute for all symbols except the Free Spins SCATTER and Golden 7’s. * JACKPOT BONUS GAME – To activate the Jackpot BONUS GAME, you must hit 3 Golden 7’s on any reels. 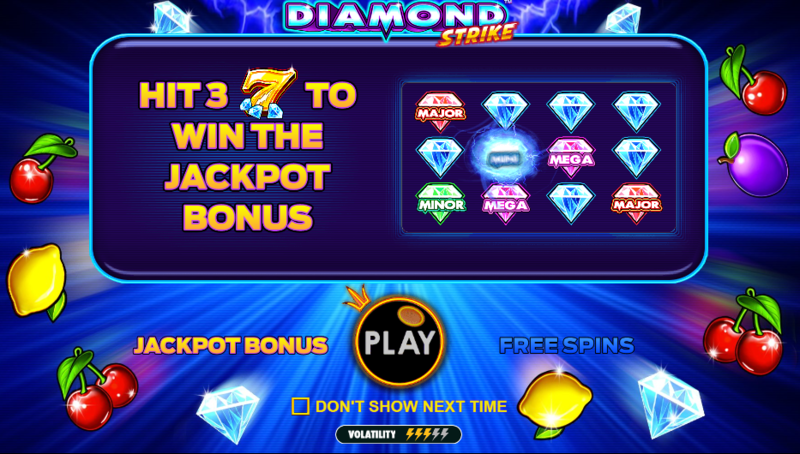 In the BONUS GAME, you will have to select diamond symbols to reveal a specific JACKPOT. If you match 3 of the same symbols then you will be awarded that specific JACKPOT. * FREE SPINS FEATURE – To activate the Free Spins FEATURE, you must hit 3 Free Spins SCATTERS on reels 1, 3 or 5. Upon doing so, you will receive 8 free spins. This feature can be re-triggered and the Jackpot Bonus Game can also be triggered during the feature. Pragmatic Play have definitely tapped into the current psyche of online slot players with this creation. The simplicity of the game is mixed with exciting bonuses and slick graphics to give players the best experience possible. Beginner or not, Diamond Strike is a game that can produce a similar amount of action that you’d normally see in progressive jackpot slots. Take a trip down memory lane with this classic slot. More slot games here, join & play now and pay with phone credit slot.